These are a lovely pair that pop - bright and fresh! 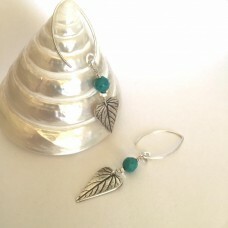 Light weight, I made imprinted the fine silver with these stunning detailed leaved from my own garden. They are flanked by stunning bright turquoise gemstones that have been faceted and sit onto long handmade hooks. All metal is silver. Measure: 6cm but very weight weight.